Guillen holding a copy of "Divided Within," his new crime novel. UHD alum John Guillen has turned his dreams of becoming a crime novelist into a reality. 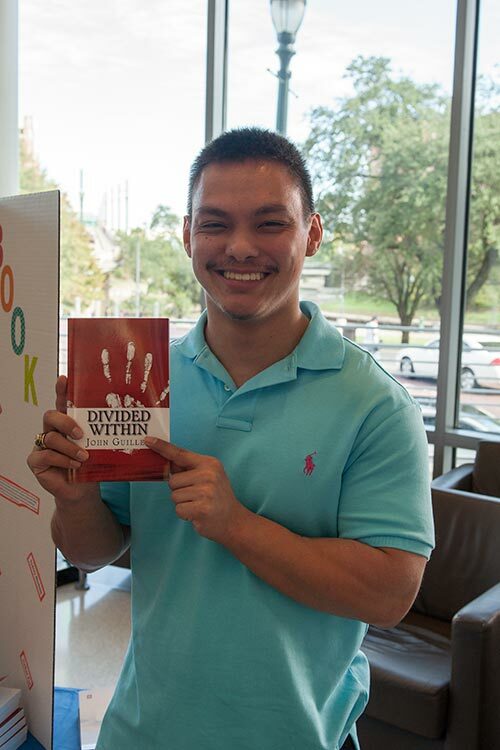 Guillen, who graduated in May 2013 with a criminal justice degree, recently released his first book, "Divided Within." "John has had this dream for a very long time. It is exciting to see our students follow through and make 'dreaming big' after graduation a reality," said Judith Harris, criminal justice instructor. According to Guillen, he knew from an early age that he wanted to become a writer. His time at the UHD criminal justice department helped him hone his skills and knowledge and he is now living his dream. A few short months after releasing his first book and Guillen is already hard at work on his second Andrew Banks crime novel.